Save your €uro's for those last minute extras on those special occasions throughout the year with our excellent saving stamps booklet. Treat yourself to a fantastic wine on Valentines night, a box of chocolates on Mother's Day, or for children, a car mag for Dad's birthday. 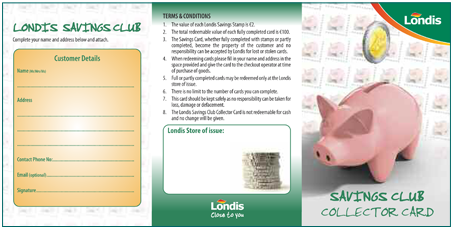 Ask in your local Londis for a Saving Stamp Booklet today.